Food. Without it, we would do. Also without it, no vacation would be the same. When we travel, we’re constantly on the lookout for the best eateries in town. One of the main reasons we travel is to get a taste of local flavors, so why would it be that a trip to Las Vegas would be any different? Really, it isn’t. In fact, outside of gambling and clubbing, many people come to Vegas to see culinary fair Sin City excels in. Being a city of eclecticism, Las Vegas is home to so many differing flavors and culinary experiences that just one trip to this great desert city is often not enough to get a taste of everything. Las Vegas is a culinary melting pot, offering flavors that span all reaches of the world. Eateries in Sin City are known for their intricate menus and diverse dishes, so it should come as no surprise when you show up looking for dinner and quickly come to realize that deciding on dinner is no easy feat. Take the easy way out and look to us here at VegasVIP. We know the ins and outs of every eatery, restaurant, buffet, and diner. We know Vegas dining like the back of our own hands. So, let us present to you the top places that you must eat at when you settle down in Vegas on vacation. The Luxor’s Public House may not be top billing for those that are used to fine dining in Las Vegas, but this hybrid sports bar / quaint restaurant certainly does deserve a spot. There’s no specialty here, so feel free to indulge in whatever looks good on the menu. Want to start off with a heavy appetizer? Try taming the chef’s kettle chip nachos, which towers a stack of house made kettle chips on top of some of the most tender brisket you will ever taste. Couple it with a creamy cheese sauce and peppers and you have yourself the perfect Americanization of the common nachos grande. 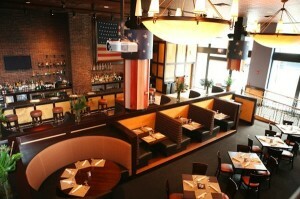 The best part of Public House is the atmosphere, which touts a sports bar-like setting amidst a casual restaurant. Televisions line all walls and a bar accentuates the sports bar feel. An attached lounge allows for small seating and separates itself from the rest of the restaurant, giving more private affairs the ideal space to slink off to. A new craze has surfaced here in Las Vegas, and that’s the concept of the Tapas menu. Adapted from the Spanish word tapar, which means “to cover”, Tapas dishes are essentially a large selection of small appetizers. Tapas dishes are meant to be ordered in bulk and are designed to serve a large group of people. Firefly takes this concept and amplifies it with a selection of amazing appetizers and full-sized dishes. Firefly’s menu is extensive to the point of intimidation. A large selection of appetizers ranging from fresh seafood to like smoked salmon to tomato bread accentuate Firefly’s delicious menu. Beyond just the food, Firefly is also home to a large selection of fine wines. Kick back with a few friends and enjoy what Firefly has to offer to indulge in one of Sin City’s truly unique dining experiences. How would a fine dining experience combined with the best view on the Las Vegas Strip sound to you? 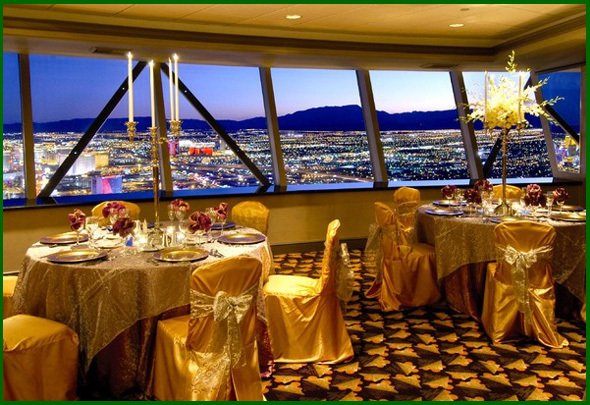 If it sounds like something you want, than you need to make your way to the Stratosphere’s Top of the World restaurant. Hands down the most unique dining experience to be had in Las Vegas, Top of the World takes you up the Stratosphere’s fear-inducing heights to a dinner with the most gorgeous view you could ask for. Overlook the entirety of the Las Vegas valley inside Top of the World as you take in the scents and flavors of a menu describable only as exquisite. From fresh seafood to expertly cooked poultry dishes, Top of the World provides five-star cuisine that must be tasted to be believed. Be warned, though: bungee jumpers from the Stratosphere’s thrill rides tend to zoom past the massive picture window – adding a little excitement to your dinner. You don’t go to the desert to have authentic Italian food, but Fiamma is looking to change that. This quaint little establishment found inside the MGM Grand is more than just an Italian restaurant. Fiamma transports you right to Italy with its authentic dishes, which include perfectly fried calamari, tender gnocchi, and a tomato sauce that will make your mother blush. Fiamma’s space is quiet, cute, and perfect for intimate occasions. Dim lighting sets the mood and a fireplace towards the back really gets the atmosphere charged. Due to its location and atmosphere, Fiamma is the perfect location to start or end a night of theatrical performances, such as Cirque du Soleil’s KA. Located near Mandalay Bay’s entrance and the LIGHT nightclub, Citizens Kitchen and Bar is one of those establishments that you don’t expect much from, but always wind up getting a world of flavors. This somewhat smaller venue provides Mandalay Bay’s guests with 24-hour dining – and no matter what time you dine, you get surprisingly exquisite flavors. Think casual dining with a fine twist. While you can get staples like sandwiches and french fries, there is a certain flavor to them that will leave you think you’ve stepped into a place that you simply cannot afford. If you’re not looking to sit down and want to take something back to your room, than Citizens’ take-out counter is where you’ll want to find yourself. Enjoy the same dine-in flavors without worrying about finding a table. Penned as being the best buffet on the Strip, the Cosmopolitan’s Wicked Spoon Buffet may be pricey, but the cost is well worth it. Wicked Spoon touts the only macaroni and cheese bar in any of Sin City’s many buffets. This alone should turn your head. Many different toppings and cheeses await your creativity as you’re left to your own greedy devices. Beyond this treat, Wicked Spoon serves surprisingly fresh flavors for a buffet. 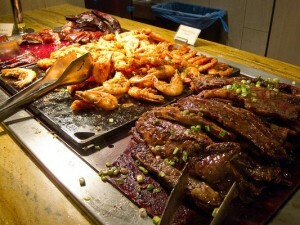 You won’t expect much from this establishment, as buffets usually offer the same fair, but Wicked Spoon delivers in flavors where most other all you can eat affairs cannot. The menu may look familiar, but the tastes are all unique and will have you forgetting that high price tag before you know it. At the Eiffel Tower restaurant, it’s all about the experience. Sure, the French-styled food is good, but there’s nothing more exciting than being able to say you’ve climbed the Eiffel Tower. Sure, you wont want to specify which Eiffel Tower; just be general. Regardless of where people think you were, in the moment you get to enjoy a first-rate view of the Fountains of Bellagio. Looking to pop the question? Can you think of a better place? Once the novelty of being in the Eiffel Tower wears off, you’ll find yourself enjoying authentic French cuisine, something you surely didn’t expect when you landed in the middle of the desert. Try the Eiffel Tower’s smoked salmon, caviar, seared scallops, or the seafood platter of lobster, shrimp, and crab. If you’re not the sea-loving type, you can dive into their pan seared pork chop with braised apples or duck breast served with camargue rice. Nestled within the Rock and Roll look of the Hard Rock Hotel and Casino is Nobu, a New York restaurant transplanted right into the desert. Nobu delivers Japanese flavors to Las Vegas in the style of scallops, octopus, tuna, and kobe beef. Despite being in the middle of the desert, Nobu’s flavors are authentic to their roots, doing its roots plenty of justice. Even Nobu’s interior takes on the style of a more traditional Japanese restaurant, with plenty of authentic accents to make you feel like you’ve stepped into a different country. 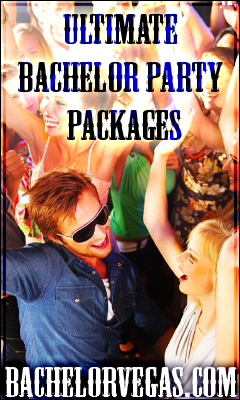 Most people think the only place to find a party in Las Vegas is within the confines of a nightclub. Margaritaville, located right on Las Vegas Boulevard, puts that thought process to the test with its fantastic atmosphere and delicious menu. This Caribbean-styled restaurant is a frat-boy haven, a fact amplified by the balcony that allows guests to overlook (rather, shout indiscriminately) over the boulevard. Margaritaville provides its patrons with a menu of eclectic eats, from towering nachos to juicy burgers. The true showstopper, though, is the large selection of hand crafted margaritas. What would Margaritaville be without its staple beverage? Kick back, relax, and simply enjoy the atmosphere in this unique establishment. Outside of being a fantastic hotel, the MGM Grand is also a hotspot for the most delicious cuisine on the Strip. 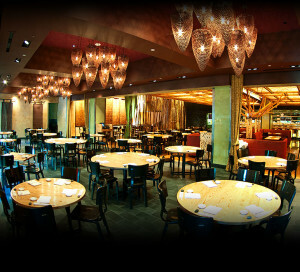 Nobhill, located inside this brilliant establishment, is one of the finer restaurants you will come across in Sin City. From fresh seafood to expertly flavored and seared steaks, Nobhill’s chef delivers an extensive menu of unbelievable fair. Utilize Nobhill’s finely decorated space as a send-off to any occasion and indulge in fresh baked breads, whipped potatoes, and a selection of appetizers to make your mouth endlessly water.